بهرام پور, راحیل, رومیانی, لاله, قطب الدین, نگار. (1397). اثر سطوح مختلف پودر تفاله گوجه فرنگی (Solanum lycopersicum) بر شاخص های زیستی رشد و ترکیبات بیوشیمیایی لاشه ماهی بنی (sharpeyi Mesopotamichthys). فصلنامه محیط زیست جانوری, 10(1), 237-242. راحیل بهرام پور; لاله رومیانی; نگار قطب الدین. "اثر سطوح مختلف پودر تفاله گوجه فرنگی (Solanum lycopersicum) بر شاخص های زیستی رشد و ترکیبات بیوشیمیایی لاشه ماهی بنی (sharpeyi Mesopotamichthys)". 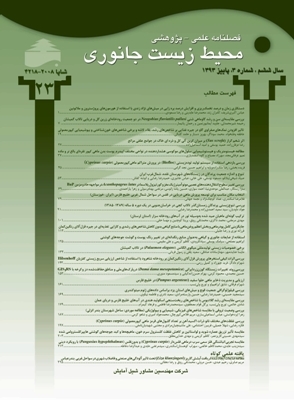 فصلنامه محیط زیست جانوری, 10, 1, 1397, 237-242. بهرام پور, راحیل, رومیانی, لاله, قطب الدین, نگار. (1397). 'اثر سطوح مختلف پودر تفاله گوجه فرنگی (Solanum lycopersicum) بر شاخص های زیستی رشد و ترکیبات بیوشیمیایی لاشه ماهی بنی (sharpeyi Mesopotamichthys)', فصلنامه محیط زیست جانوری, 10(1), pp. 237-242. بهرام پور, راحیل, رومیانی, لاله, قطب الدین, نگار. اثر سطوح مختلف پودر تفاله گوجه فرنگی (Solanum lycopersicum) بر شاخص های زیستی رشد و ترکیبات بیوشیمیایی لاشه ماهی بنی (sharpeyi Mesopotamichthys). فصلنامه محیط زیست جانوری, 1397; 10(1): 237-242. یکی از راه­ های اقتصادی در تولید پایدار آبزیان پرورشی، استفاده از جیره ­های غذایی خوب با حداکثر کارایی رشد و سلامت آبزی می­ باشد. هدف اصلی از این تحقیق بررسی سطوح مختلف پودر تفاله گوجه فرنگی بر عملکرد رشد و ترکیب لاشه بدن ماهی بنی (sharpeyi Mesopotamichthys) می باشد. 4 جیره غذایی با ترکیبات پروتئینی مشابه (گروه شاهد 0%، 10%، 20% و 30% تفاله گوجه فرنگی) تهیه شد. تعداد 240 عدد ماهی بنی انگشت قد با وزن 0/05±8/14 میان 12 آکواریوم با حجم 120 لیتر آب تقسیم شدند. آزمایش 8 هفته به ­طول انجامید. به ­علت عدم وارد شدن استرس به ماهیان عملیات زیست­ سنجی تنها در ابتدا و انتهای دوره آزمایش انجام گردید. نتایج حاصل از این تحقیق حاکی از آن است که استفاده از جیره ­های غذایی حاوی پودر تفاله گوجه فرنگی اثرات مثبتی بر عملکرد رشد دارد هر چند که تفاوت معنی­ دار را با گروه شاهد نشان نداد. در مورد ترکیبات بیوشیمیایی بدن تیمارهای 20 و 30 درصد پودر تفاله گوجه فرنگی تفاوت معنی ­دار را در پروتئین با گروه شاهد نشان می دهند و لذا می ­توان از آن به ­عنوان یک ماده جایگزین منابع پروتئینی غذای ماهی به ­ویژه پروتئین­ های گیاهی استفاده نمود. رحیمی ­پردنجانی، ح.؛ غفاری، م.؛ قرایی، ا.؛ فتح ­الهی، م. و محمدی، ح.، 1392. تاثیر سطوح مختلف پودر گوجه فرنگی جیره بر شاخص ­های رشد، کارآیی تغذیه و میزان بقاء در ماهی قزل ­آلای رنگین­ کمان. پایان­ نامه کارشناسی ­ارشد. دانشگاه زابل. 65 صفحه. رضوی ­شیرازی، ح.، 1380. تکنولوژی فرآورده­ های دریایی (علم فرآوری جلد دوم). انتشارات نقش مهر، چاپ اول، تهران، 292 صفحه. ساعدی، م.؛ سجادی، م.؛ حسین ­زاده­ صحافی، ه. و عمادی، ح.، 1391. اثر جایگزینی آرد ماهی با آرد سویا در جیره غذایی ماهی پاکوی قرمز. نشریه شیلات دانشگاه تهران، مجله منابع طبیعی ایران. دوره 65، شماره 1، صفحات ۲۷ تا 37. سلیمی ­خورشیدی، ن.؛ کیوان­ شکوه، س.؛ سلاطی، ا.؛ ذاکری، م.؛ محمدی، ن. و طهماسبی­ کهیانی، ا.، 1391. تاثیر سطوح مختلف نوکلئوتید جیره بر ترکیب لاشه در ماهی قزل­ آلای رنگین کمان انگشت قد (Oncorhynchusmykiss). اقیانوس شناسی. سال3، شماره 9، صفحات 41 تا46. AOAC (Association of Official Analytical Chemists). 1995. Official Methods of Analysis, 16th edition. Association of Official Analytical Chemists, Arlington, Virginia, USA. Chih, B.; Liu, P.; Chinn, C.; Chalaouni, C.; Komuves, L. G.; Hass, P. E.; Sandoval, W. and Pererson, A. S., 2012. A ciliopathy complex at the transition zone protects the cilia as a privileged membrane domain. Nature Cell Biology. Vol. 14, pp: 61-72. Gatlin, D.M., 2002. Nutrition and fish health, In: Fish Nutrition, (eds) Halver, J.E., and Hardy, R.W., Academic press, San Diego, CA. 760 p.
Goda, A.M.; El-Haroun, E.R. and KabirChowdhury, M.A., 2007. Effect of totally or partially replacing fish meal by alternative proein sources on growth of African catfish Clarias gariepinus (Burchell, 1822) reared in concrete tank. Aquaculture resource. Vol. 38, No. 3, pp: 279-287. Haddadian, M.S.Y. ; Abu-Reesh, I.M. ; Haddadian, F.A.S. and Robinson, R.K., 2001. Utilization of tomato pomace as a substrate for the production of vitamin B12 a preliminary appraisal. Bioresource Technology. Vol. 78, pp: 225-230. Hernandez, M.D. ; Martinez, F.J.; Jover, M. and Garcia, B., 2007. Effect of partial replacement of fish meal by soybean meal in sharpsnout seabream (Diplodus puntazzo) diet. Aquaculture. Vol. 263, pp: 159-167. Hoffman, L.; Prinsloo, J. and Rukan, G., 1997. Partial replacement of fish meal with either soybean meal, brewers yeast or tomato meal in the diets of African sharptooth catfish (Clarias gariepinus). Water SA. Vol. 23, No. 2, pp: 181-186. Hung, S.S.O. ; Lutes, P.B. ; Shqueir, A.A. and Conte, F.S., 1993. Effect of feeding rate and water temperature on growth of juvenile white sturgeon (Acipenser transmontanus). Aquaculture. Vol. 115, pp: 297-303. Jafari, M.; Pirmohammadi, R. and Bampidis, V., 2006. The use of dried tomato pulp in diets of laying hens. International journal of poultry science. Vol. 5, pp: 618-622. Jiri, R., 2000. Influence of astaxanthin on growth rate, condition, and some blood indices of rainbow trout (Oncorhynchus mykiss). Aquaculture. Vol. 190, pp: 27-47. Kanǵ ombe, J.; Likongwe, J.S. ; Eda, H. and Mtimuni, J.P., 2007. Effect of varying dietary energy level on feed intake, feed conversion, whole-body composition and growth of Mala-wian tilapia, Oreochromis shiranus- Boulenger. Aquaculture Research. Vol. 38, pp: 373-380. Kashif, U. and Muhammad, A., 2009. Replacement of Fishmeal with Blend of Canola Meal and Corn Gluten Meal, and an Attempt to Find Alternate Source of Milk Fat for Rohu (Labeo rohita). Pakistan Journal of Zoology. Vol. 41, No. 6, pp: 469-474. Keramat Amirkolaie, A.; Dadashi, F.; Ouraji, H. and Jani Khalili, K., 2015. The potential of tomato pomace as a feed ingredient in common carp (Cyprinus carpio L.) diet. Jpurnal of Animal and Feed Sciences. Vol. 24, pp: 153-159. Maniat, M.; Ghotbodin, N. and Rajabzadeh Ghatrami, A., 2014. Effect of garlic on growth performance and body composition of benni fish (Mesopotamichthys sharpeyi). International of Biosciences, Vol. 5, No. 4, pp: 269-277. Medina, I.; Sacchi, R.; Biodi, L.; Aubourg, S.P. and Paolillo, L., 1998. Effect of packing media on the oxidation of canned tuna lipids. Antioxidant effectiveness of extra virgin olive oil. Journal of Agriculture food chemistery. Vol. 46, No. 3, pp: 1150-1157. Persia, M.E. ; Parsons, C.M. ; Schang, M. and Azcona, J., 2003. Nutritional evaluation of dried tomato seeds. Poultry Science. Vol. 82, No. 1, pp: 141-146. Raky, F.A. and Mikhail, S.K., 2008. Effect of replacement of fish meal protein with boiled full fat soybean seeds with dried algae on growth performance, nutrient utilization and some blood parameters of Nile tilapia (Oreochromis niloticus). Egyptian Journal of Aquatic Biology and Fisheries. Vol. 12, No. 4, pp: 41-61. Saghaee, A.; Ghotbeddin, N. and Rajabzadeh Ghatrami, E., 2015. Evaluation of growth performance and body composition of Oscar fish (Astronotus ocellatus) in response to the consumption of dietary intake of garlic (Allium sativum). Bioflux. Vol. 8, No. 4, pp: 485-490. Sogi, D.S. ; Bhatia, R.S. ; Garg, K. and Bawa, A.S., 2005. Biological evaluation of tomato waste seed meals and protein concentrate. Journal of Food Engineering. Vol. 71, No. 4, pp: 341-344. Tacon, A.G.J., 1990. Standard Method for Nutritional and feeding of farmed fish and shrimp. Argent laboratories Press. pp: 4-27. Tomecynski, R. and Soska, Z., 1976. Estimation of biological value and chemical composition of seeds and skins of tomatoes. Zeszyty Naukowe Akademii Rolniczo Techniczncj Wolsztynie. Vol. 189, pp: 153-164.